← EXPLOIT…One Word, Express In One Hundred Words In One Hundred Days. MAN…One Word, Express In One Hundred Words In One Hundred Days. Equality In Homes Is The Source Of Unending Divorce In The World. This Is One Fact About Life That You Can’t Boycott: Men Are The Head Of The Home And Women Is Their Helpers. Thinking Otherwise Is Naïve. 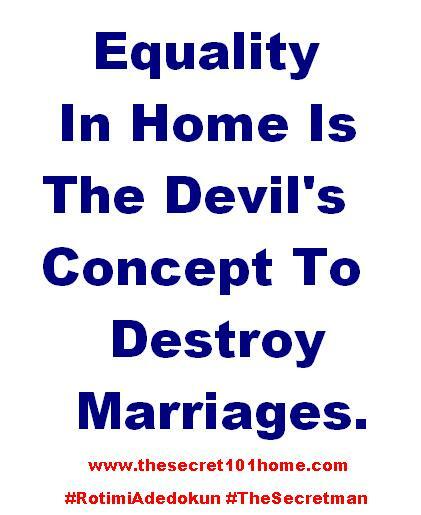 Equality In Home Is The Devil’s Concept To Destroy Marriages. Remember God Is The Only Wise God. He Has A Strong Reason For Setting Up Marriage That Way. Life Is Simple If You Place According To The Set Rules And Practice The Foundational Secrets. Anything That Has Two Heads Is A Muster, So HomesAre Head By Men, Men And Women. This entry was posted in The Secret, Vitamin Of The Mind and tagged Bishop David Oyedepo On Families, Family, Family Success, How Is The End Of The Family, How To Build good Family, Husband And WIfe, In The Beginning, Jim Rohn, Pastor E A Adeboye On Homes, The Secret Of Good Family. Bookmark the permalink.